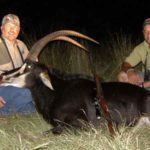 African sable hunting is considered to be one of the most popular hunting trophies in Southern Africa. 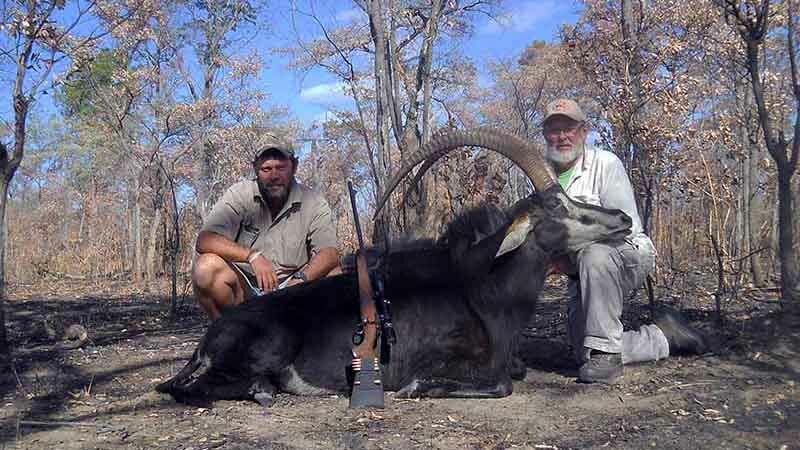 Sable antelope have the honorary distinction of being the National Animal of Zimbabwe. These large handsome antelope (genus hippotragus niger) stand out from their counterparts for their impressive stature and long scimitar style horns that curve backwards. 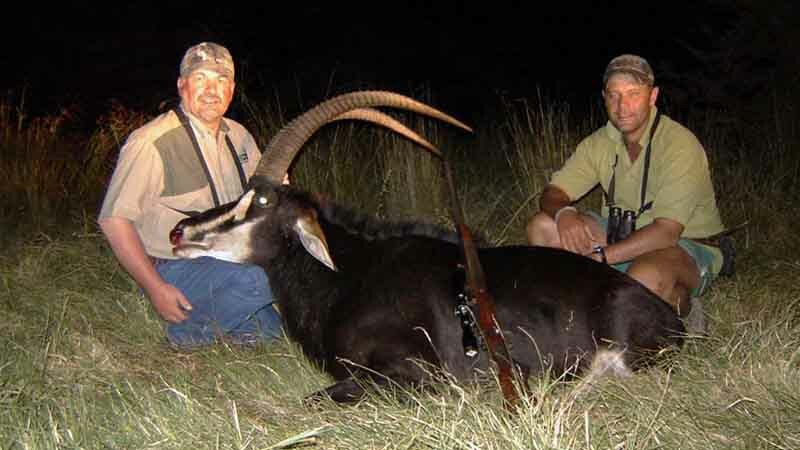 These antelope are often known as the southern, common, black or Matsetsi sable. The latter name stems from the area in Zimbabwe where they are most prevalent – the Matsetsi Valley. The black reference refers to the male’s dark glossy coats which makes the animal conspicuous in the cold months against the beige grasses and winter hues. The female and young are dark reddish brown in comparison. Both genders display striking pure white bellies and facial markings that are made more distinctive against their dark coats. These statuesque animals are barrel-chested antelope featuring a short neck with a stiff black mane, brick red coloured ears and a long face displaying their facial markings. Their conspicuous mane and its horse-like build have earned them the nickname ‘Hippotragini’, meaning ‘horse-goat’. 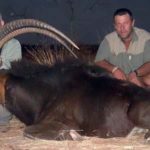 They are a fairly large mammal with the bulls reaching a shoulder height of up to 1.4 m and weighing up to 270 kg and the female up to 220kg. The cows tend to be slightly lighter in colour and slightly smaller. An interesting statistic is that their body weight matches lions and tigers! 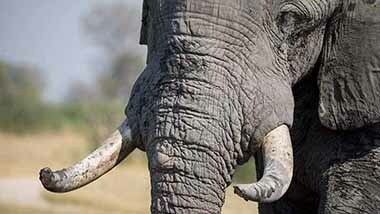 The horns are the most impressive feature of this herbivore. 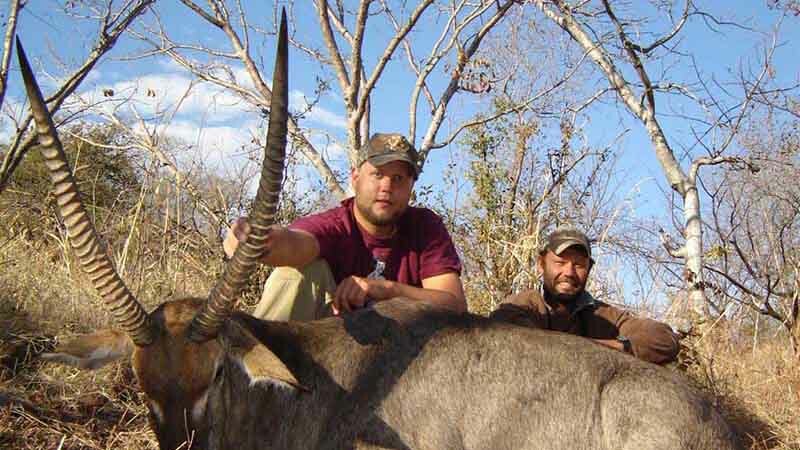 They are the longest of any African antelope, apart from the kudu’s twisting masterpieces. Both the male and female sport long ridged or ringed horns that sweep backwards in a curve. 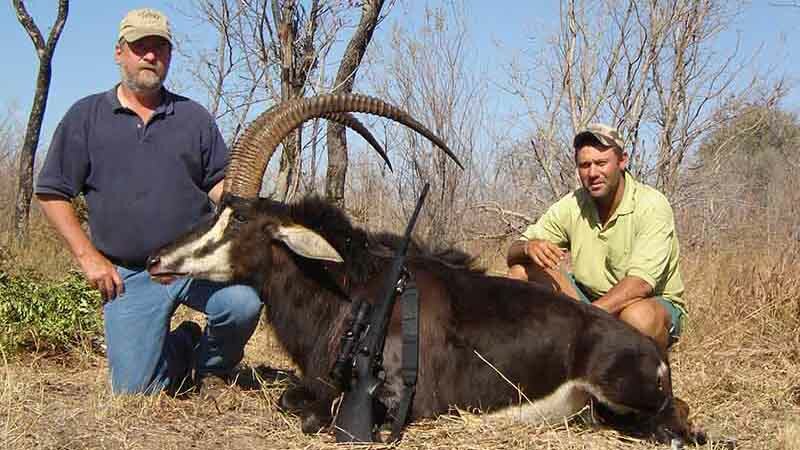 The length of mature bulls horns can reach 1.2 metres with the female showing shorter and thinner versions – with both sexes having smooth, sharp tips. A sable’s lifespan is between 16 and 19 years. 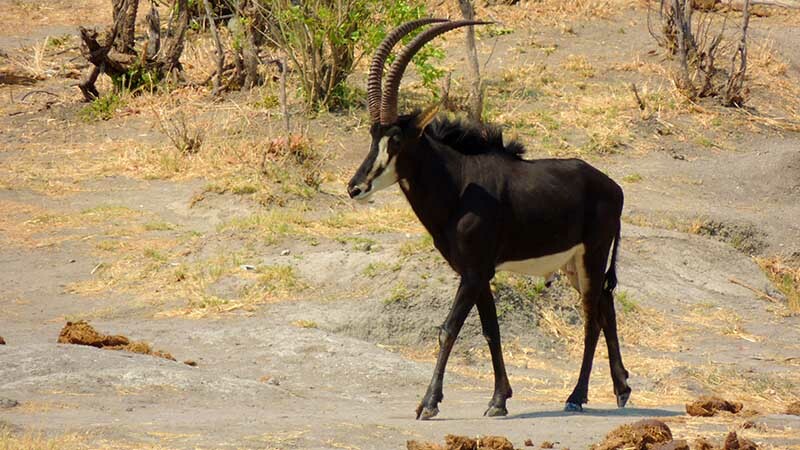 As with most antelope, Sable is naturally shy – but can be aggressive when they feel they are under threat or injured. 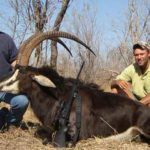 You will find these antelope in herds of 10 to 30 animals, generally consisting of females and their young, with one bull looking after them. Young bulls which have been pushed out of the herd at about 3 years old make up a bachelor herd which can contain up to 12 individuals. When a breeding herd gets too large, there will be a natural migration into smaller herds. 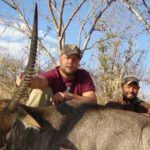 This is the opportunity for the strongest male in a bachelor group to claim the new herd as his own. The new bull will continuously patrol round his herd, warding off challenging males and encouraging females to join. Generally they are diurnal, being active in the early morning and late afternoon hours, particularly at dusk just before the sun sets to avoid predators. They like to drink at mid-day and will only move approximately a mile each day while grazing. During the winter months, they will keep to an even smaller area of movement. 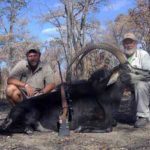 In the late winter, the herds will congregate in burnt areas where new growth of grass and leaves are available and in moist vlei areas taking advantage of the moisture and greener grasses. Sable are herbivorous and therefore specialized browsing animals mainly found in the southern hemisphere savannas in Africa, specifically in the Miombo woodland areas. They enjoy feeding on foliage, leaves, medium length grass, and herbs – with leaves from trees being ninety percent of their diet. They particularly like plants growing on termite mounds because of their greenery and taste. Because of their browsing habits, they prefer wooded savannah areas or moist vleis offering open and sparse woodland near grasslands not far from a water source. They do tend to avoid wide-open grassland areas where possible. These antelope live in fairly large herds of up to 30 with a bull in charge. The bulls are very territorial and on the lookout all the time for interlopers to his herd, including a hunter. So be aware that he can be very aggressive and will not hesitate to charge if he feels cornered or threatened or wounded. 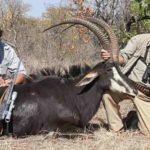 Sable hunting is best done in the early morning and late afternoon when the herd is grazing in more open areas. They are daily drinkers at mid-day so will use regular trails to the watering holes. The male is easy to spot with his horns and he will always be on the edge of the herd. Just be ready for a charge.